Milkshakes are true American standards — chocolate, vanilla, and strawberry have the ability to take us back to diner days or hot summer afternoons.Whether you decide on classic or novel versions, people have been indulging on milkshakes for more than a century, often betraying their diets, but always finding satisfaction at the bottom! Here are 5 milkshakes worth trying this weekend! If you are looking for a milkshake to knock your socks off, the Rookery is the place to go. Some describe it as a full dessert in a glass. From a Blueberry Cobbler Shake to a Pineapple Upside-down Shake, you will not be disappointed. The Rookery’s creative take on classic milkshakes is an experience on its own. Each milkshake is bursting with flavor and a brain freeze to match, so drink slow! With over 30 flavors to choose, you are almost guaranteed a home run with any Cook-Out Fancy Milkshake. While the Strawberry Cheesecake is a fan favorite, you cannot go wrong with a Hi-C Punch Shake or the famous Mint Chocolate Chip. The line may be long, but it is well worth it! While Freddy’s Milkshakes are known as “concretes” due to their thickness, they are among the top favorites in the milkshake category. Unlike most milkshakes that are made with ice cream, Freddy’s concretes are made from frozen custard that is made in-house at each restaurant. From Butterscotch to a Dirt N’Worms concrete, you are sure to leave satisfied. 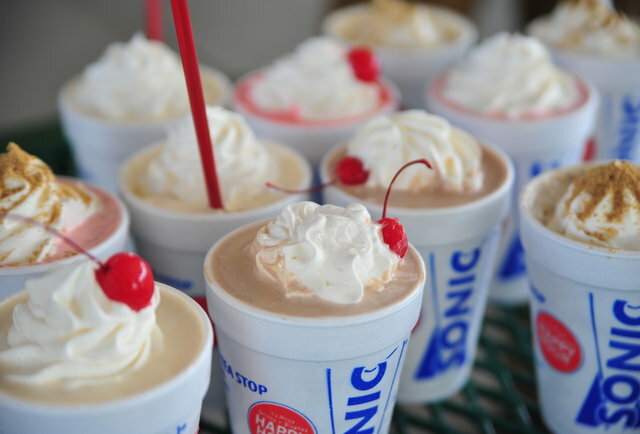 Known for its many varieties, Sonic has about every milkshake flavor your heart may desire. You also have the option to mix flavors to make your favorite combination. While Sonic may be a fast food chain, their milkshakes are made individually and with real fruit. If you are lucky, you may run into one of their many ½ off nights during the summer! There is an old saying that if it’s not broke, don’t fix it. Chick-Fil-A’s traditional milkshakes are at the top their class. From classic flavors to some seasonal favorites, Chick-Fil-A’s milkshakes are consistently thick, refreshing and always with a cherry on top.